OF THE SPORADES ISLANDS COMPLEX!!! 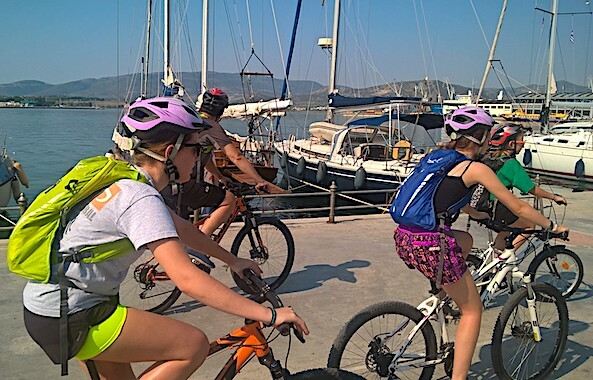 This 7-days tour is the ultimate trip for those who want to enjoy cycling on Pelion in combination with sailing to the Sporades islands. The participants will have the opportunity to cycle, to swim and discover Pelion, the most beautiful mountain in Greece, and the famous cosmopolitan islands of the Sporades: Skiathos, Skopelos and Alonissos. Traveling from place to place with modern sailing yachts with a skipper, we will live the magic of the cruise and the adventure of mountain biking, visiting arguably the most beautiful part of Greece. Approximately 160 km of biking in 5 days (90% of trails and paths) with guide provided. Kids can join on the responsibility of their parents if they are at least 14 years old. You can choose a tour date if you are a group of 6 to 8 riders. 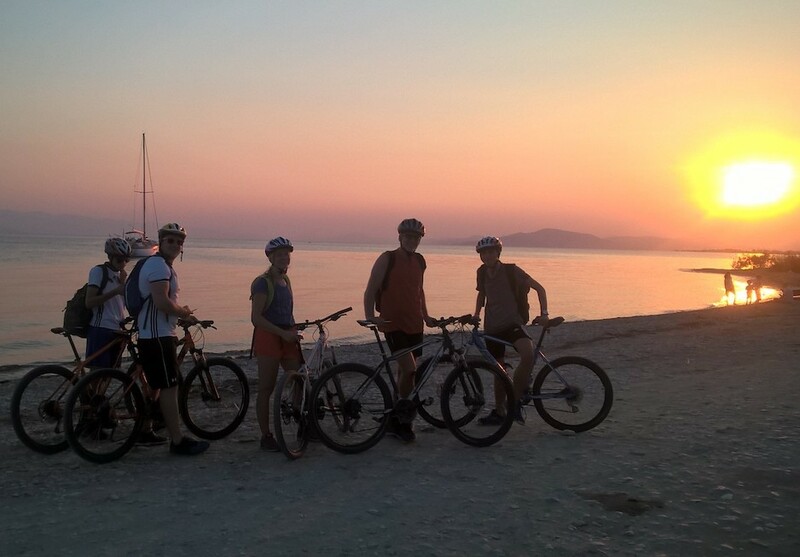 DAY 1.Athens - Volos - Skiathos island: 32 Km MTB riding, 46 nmi sailing Arrival at the airport. Transfer to Volos and arrangement on sailing boat. Then take a 3-4 hour cycling trip to Pelion. So we will have the chance to see some of the hidden beauties of the Gods Mountain that are really unique. We will visit traditional villages and enjoy the breathtaking view. In the evening we will take our dinner by the sea and then sail for the island of Skiathos. We take our breakfast on board and start for the next cycling tour. A beautiful route will help us discover the island on two wheels. After cycling for about 3,5 hours, SUP (stand up paddling boards) will always be available for those who want to paddle across the coastline. In the evening eat at one of the island's taverns, tasting local flavors. Later Skiathos by night. DAY 3. Skiathos Isl. - Skopelos Isl. : 30 Km ridind, 19 nmi sailing Good breakfast and we will ride our bikes and go on the other side of the island. We will cycle for 3 hours in the forest and then swim at Koukounaries beach, which has been awarded as one of the best beaches. Relaxation, perhaps a little SUP or snorkeling and evening by the sea. Later we sail for Skopelos Island. DAY 4. 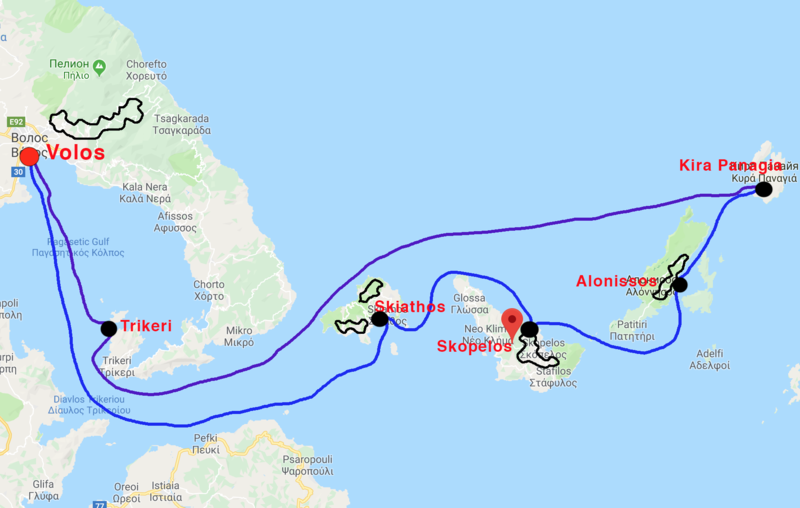 Skopelos Island - Alonissos: 38 Km ridind, 13,5 nmi sailing Breakfast and we start with the bikes to get to know one of the most beautiful islands of the Aegean Sea, Skopelos. A unique combination, green forest and wonderful beaches. We will ride around 3-4 hours in beautiful places and swim in crystal-clear waters. Dinner with traditional flavors, Greek music and dancing. Slowly sail for the island of Alonissos. DAY 5. Alonissos island: 30 km riding. We take a good breakfast and start with our bikes to get to know the smallest but also purest, traditional island of the Sporades. After our ride we will be able to discover the coastline of the island with the SUP's we will always have on board. Walk around the village , the old city and visiting the best places. In the evening we will visit one of the island's tavern for good food and good local wine. DAY 6. Alonissos - Kira Panagia isl. : 13 nmi sailing After eating breakfast we sail for a small island complex where we will spend the day swim and fishing. In the evening we will stay there taking our dinner on board. DAY 7.Kira Panagia - Trikeri - Volos: 98 nmi sailing We start our return trip very early in the morning and arrive at Volos city in the afternoon passing through amazing places on the way such as Trikeri island. Is about a very small island where pollution and traffic are unknown words. No roads, no cars only ancient paths. We will visit the Monastery at the top ofthe hill and hike a little around. Walk to the beach of Volos and a farewell meal. Visit the most important sights of the city and transfer to the airport. 1.we may partially modify the program if it considers that there are reasonable grounds (e.g. bad weather, safety of participants, technical problems, etc. ).